This past weekend my wife and I had planned a trip up to the U.P. of Michigan but they had a big snowstorm and we wouldn’t have been able to stay until it ended. We decided to stick around home. On Saturday we drove out to the 12 mile marker on the Red Cedar Trail and hiked back toward Downsville. We ended up hiking from the trail intersection on County Y to the Dunnville Sandstone Quarry. 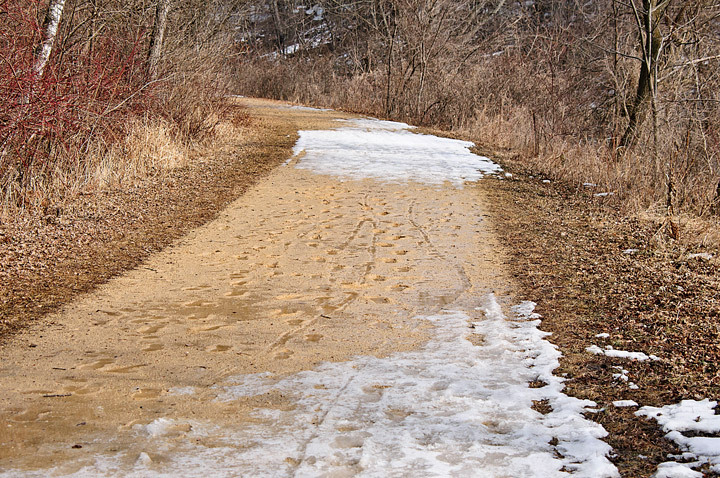 The trail was a combination of gravel, snow and ice. 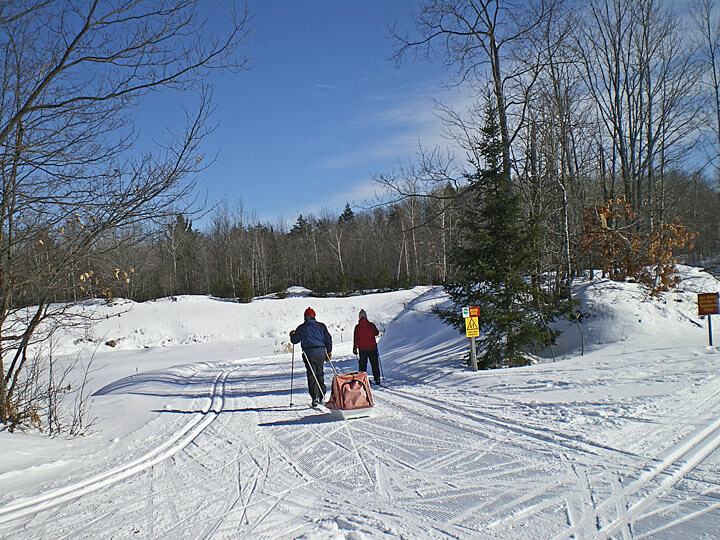 It is a multiuse section of the trail that is used for skiing, snowshoeing and hiking. 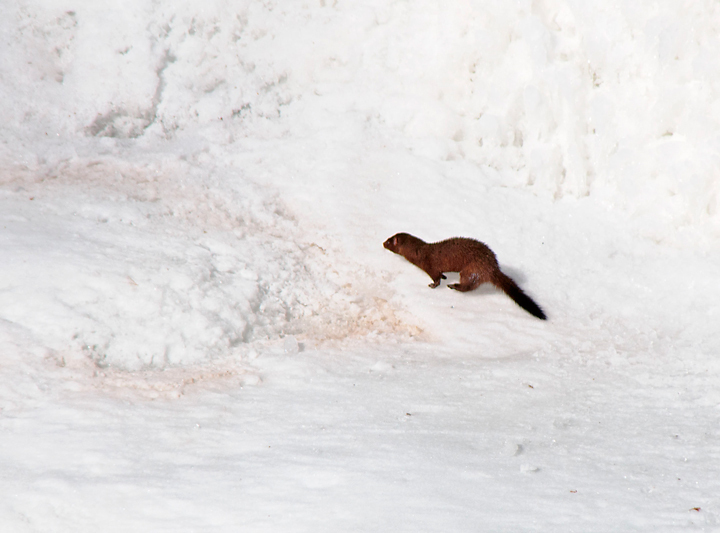 There was evidence that many different critters were using the trail. We found tracks on the trail from, people, horses, deer, turkeys, Raccoons, mice and rabbits. 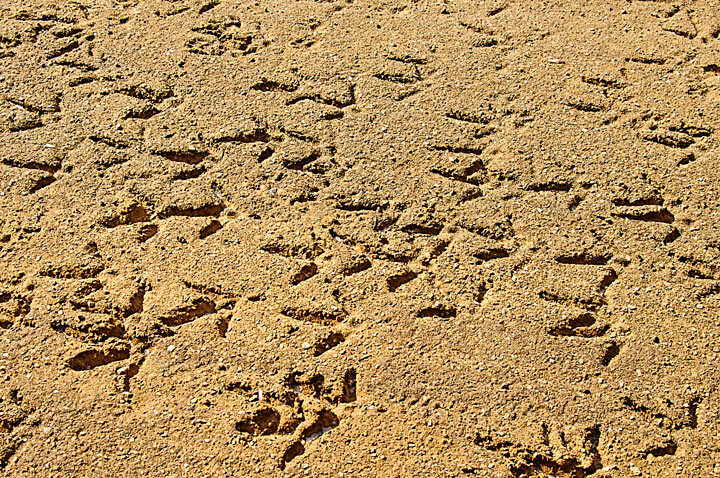 It looked like a flock of Wild Turkeys had walked down the trail when the ground was soft. Normally there are some nice ice falls along the trail but this year things were a little sparse. On the on the other hand with no snow cover it was much easier to walk back into the ice falls. 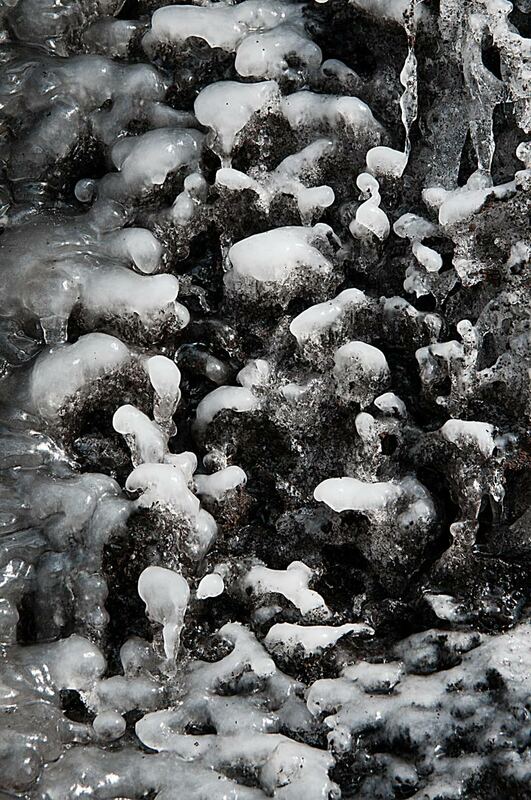 Most of the ice along the trail was milky white. 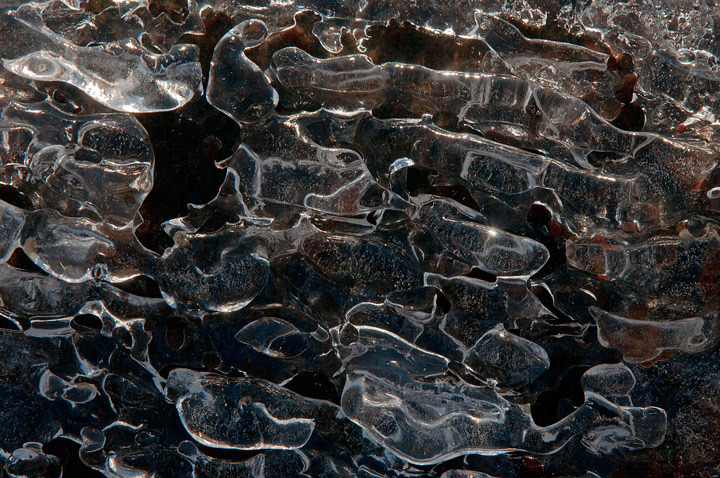 One ice fall was particularly interesting because it consisted mainly of black ice. 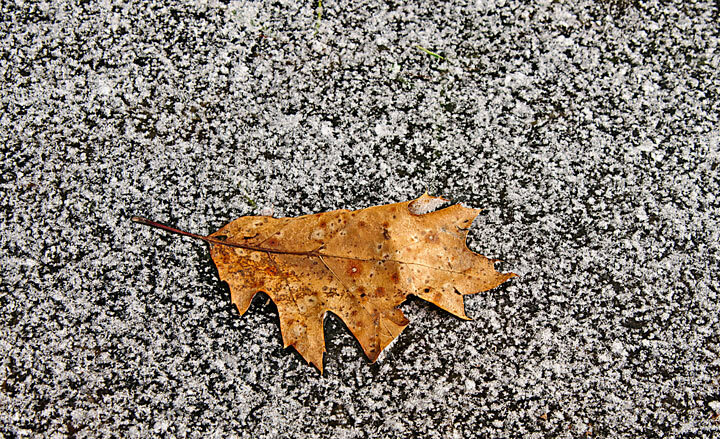 There were also opportunities to photograph leaves that had melted into the snow. 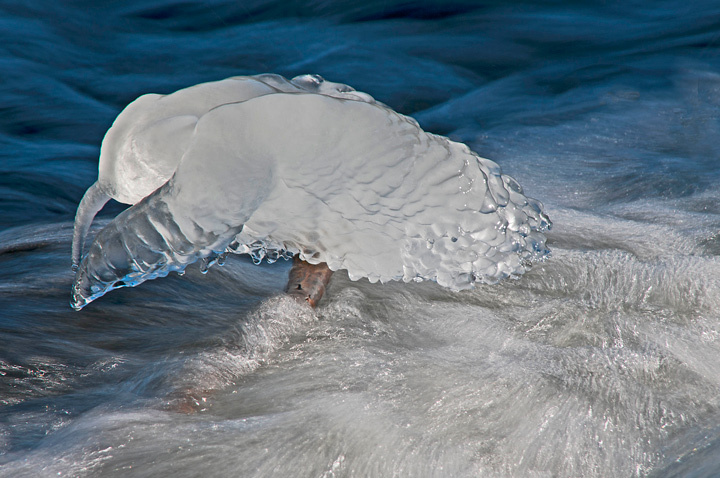 This is a leaf that happened to be sitting on top of a rare patch of ice in the ditch along the trail. 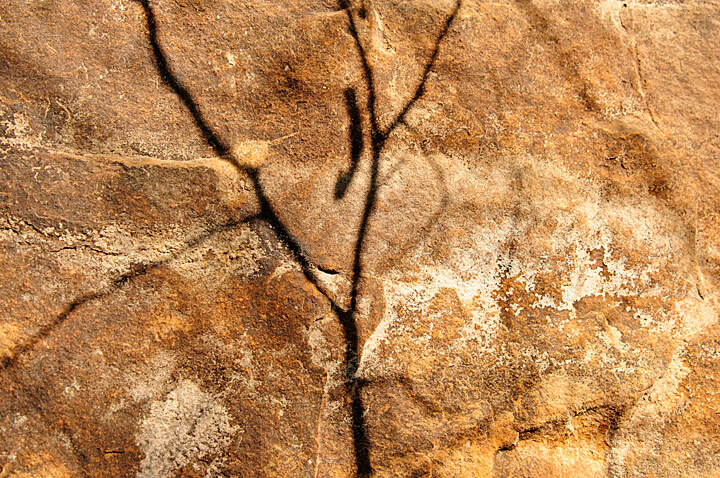 I like to hike this section of the trail on a sunny winter day when the late afternoon sun hits the Dunnville sandstone it really brings out the color. 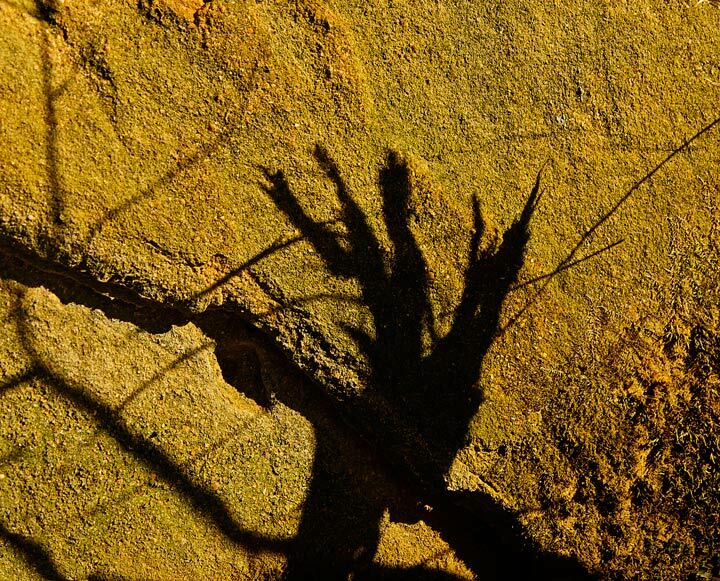 It also creates some interesting shadow patterns on the sandstone walls. 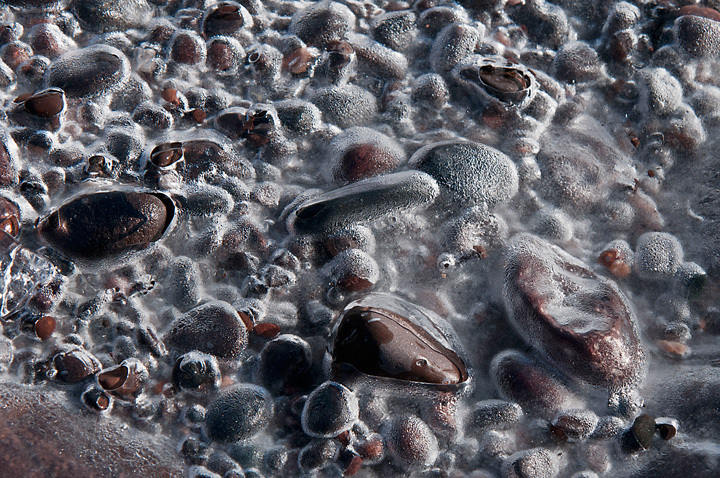 A few weeks ago I posted some photos of ice patterns at Grand Marais Harbor. 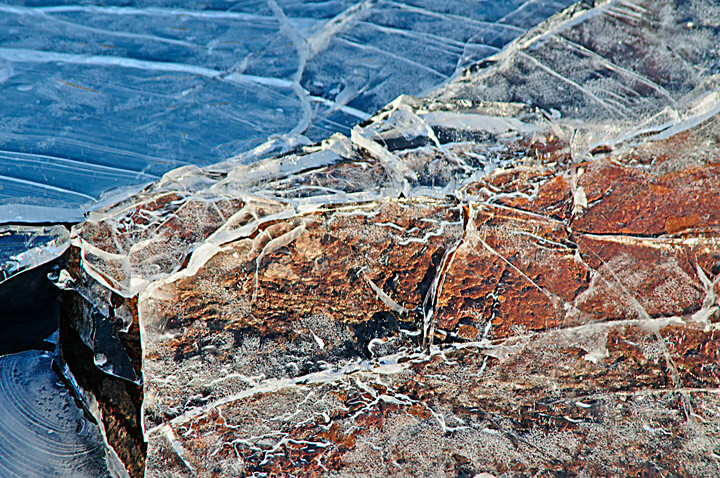 On the same trip I photographed some ice patterns at Tettegouche State Park. 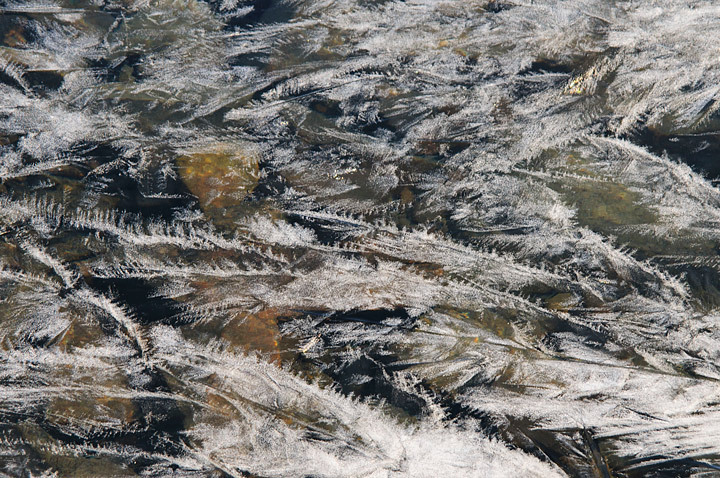 While not as rich in opportunities it did offer a little bit different perspective on ice patterns. In the last few days I’ve had a chance to hike the trail from Menomonie to Downsville. On Saturday it was a beautiful morning so my wife and I decided to take a walk on the Red Cedar Trail. Normally this time of year it is a ski only trail but with the lack of snow and warm weather it has remained open for hiking. We drove down to Irvington and then hiked to Downsville. We hadn’t really planned on hiking that far but it was a beautiful day and by the time we reached the six mile marker we realized it wasn’t that far to Downsville. The fact that we like to stop at the Downsville Coffee House for lunch helped us decide to keep going. The trail was mainly snow and ice covered the entire way. There is a good base on the trail if we would ever get more snow. A few skate skiers had been skiing the trail but there were no tracks for classic skiing. There are an increasing number of bare spots on the trail and with the warm weather today they were muddy. We saw quite a few birds along the trail. Several flocks of Cedar Waxwings that seemed to be feeding on bugs. There were quite a few bugs that looked like mosquitoes but I expect (hope) they were something else. We saw a number of ducks and geese along the river. As we neared Downsville there were a large number of Bald Eagles circulating above the river. At one point we counted 15 mature and immature eagles. Several of them were involved in courtship flight. Unfortunately they were a little far to get a good shot. In all we saw over 20 Bald Eagles on the hike. There wasn’t a lot to photograph. 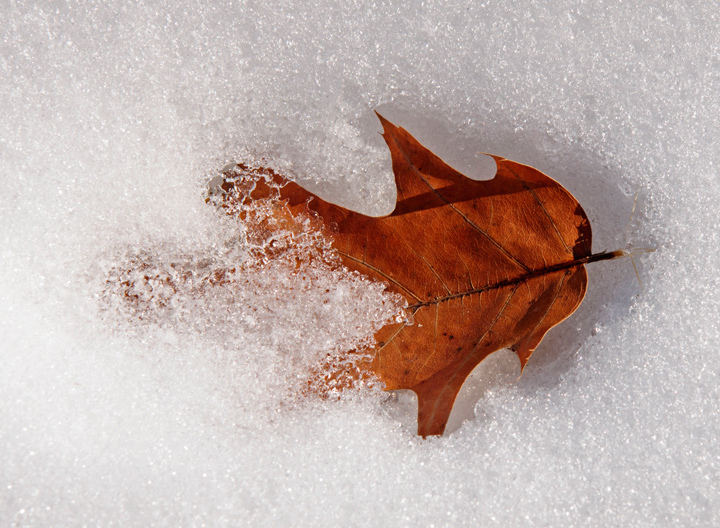 The main subject was leaves that were slowly melting into the snow. This is usually a subject for mid to late March. 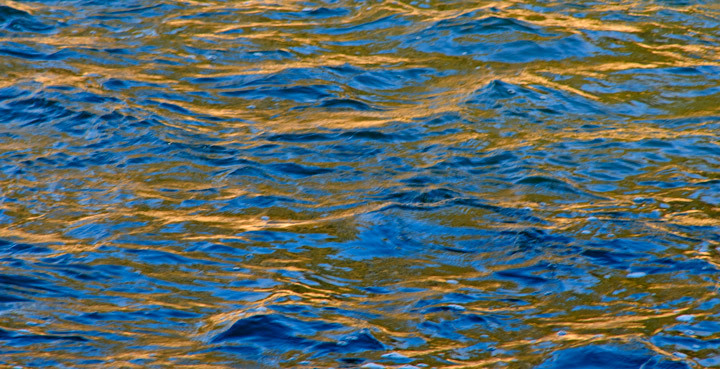 Later in the afternoon there are some good shots of reflections in the river to be had. This afternoon I hiked the stretch from Menomonie to Irvington. Today there were more patches of gravel (Mud) on the trail than there was on Saturday. Not a lot to see. The Bald Eagle was on the nest in the large pine tree across from the ice wall at the 1.5 mile mark. 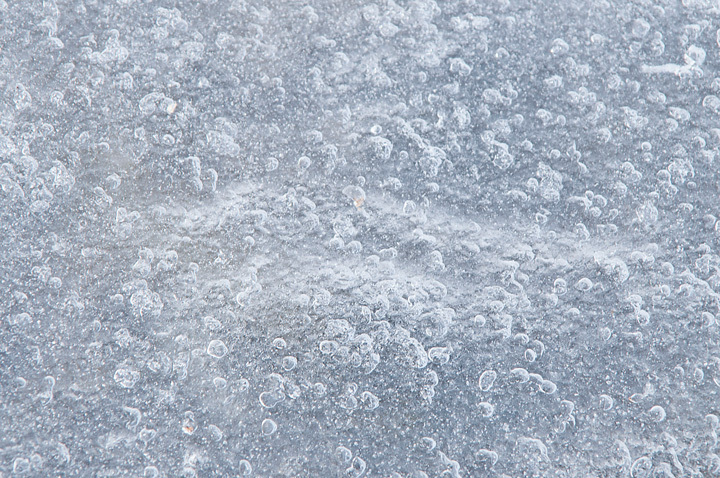 I watched it for a while then turned around to take some photos of the ice wall. When I looked back there was a eagle flying across the river heading right for me. In a maneuver only I could make I quickly tried to focus on the eagle and change the aperture setting at the same time. Unfortunately just as the eagle came into a clear view I managed to turn the camera off rather than change the aperture. It’s unfortunate that the weather hasn’t been colder. With the lack of snow the Red Cedar Trail has been open to hiking so more folks could have walked down to the ice wall. Even with the warm weather there was some nice ice on the wall. Update; With the recent snow the trail has been closed to hiking once again. I think the DNR is a little overly optimistic about the potential for skiing but it’s not my call. 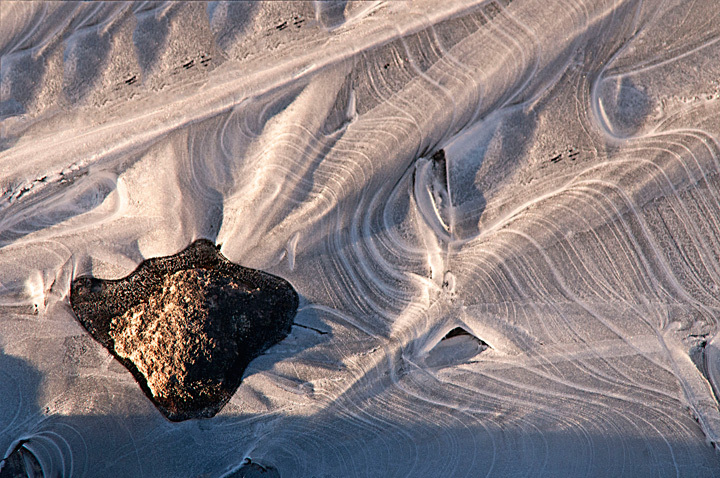 I happened to find the fascinating would of Grand Marais Harbor ice patterns by accident. A number of years ago my wife and I took a group of kids up to Lutsen Mountain skiing. 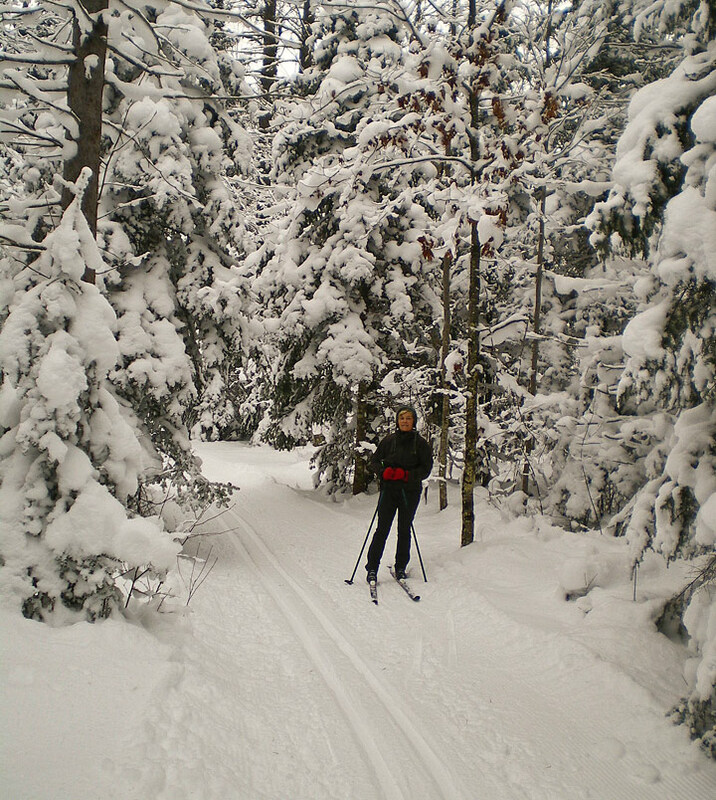 We had planned to do some cross country skiing while the kids downhill skied at Lutsen. Unfortunately it rained all the way up the North Shore. The next morning it turned colder. Downhill skiing was really fast but the cross country trails were a mess. 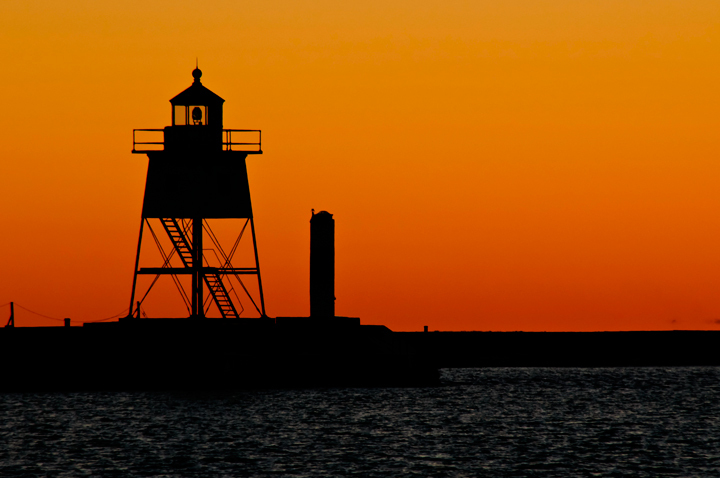 My wife and I decided to drive up the North Shore to Grand Marais to do a little shopping and look around the harbor. The Ben Franklin store in Grand Marais is not to be missed. They have everything you will need to survive in the north woods. 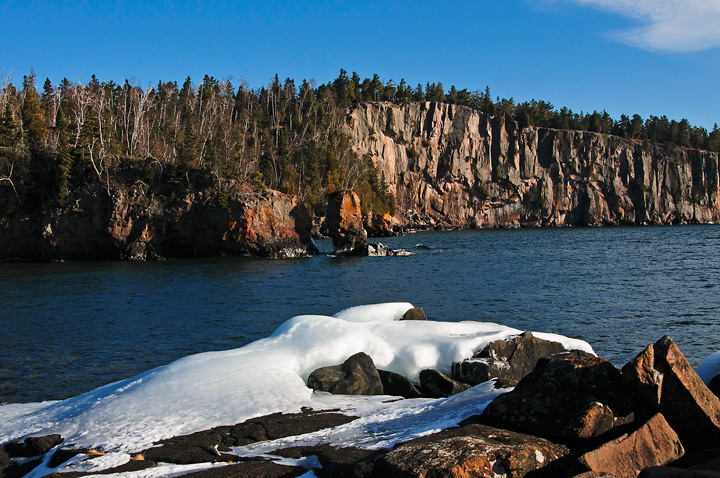 The Grand Marais Harbor breakwater is a cement structure built on top of a natural rock formation. 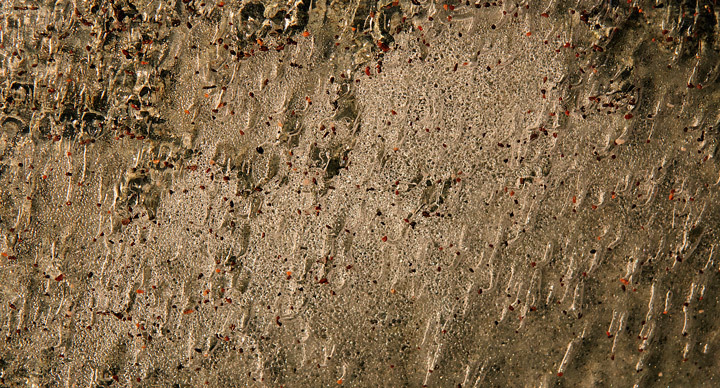 Outside the breakwater there is a considerable area of exposed rock. As we walked along the breakwater we noticed that when heavy waves washed over the exposed rock water had been trapped in large cracks and small depressions. 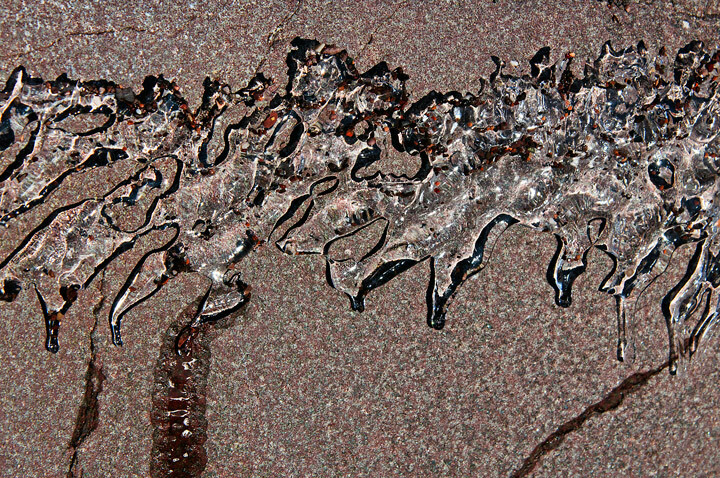 It then froze creating some fascinating ice patterns. 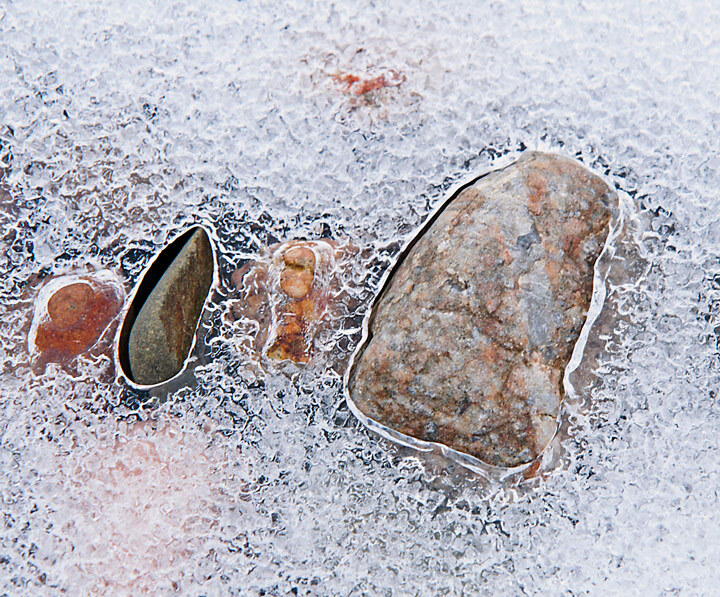 We spend a good part of a very cold afternoon walking around the rocks looking at ice patterns. 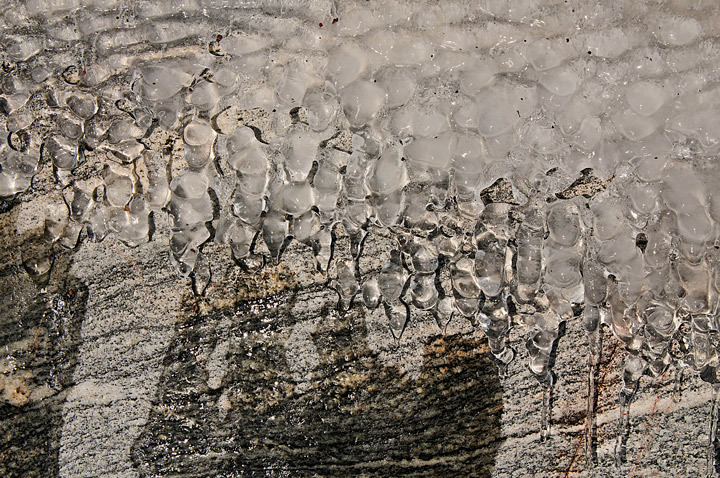 We have since returned to Grand Marais a number of times to look for and photograph the ice patterns. 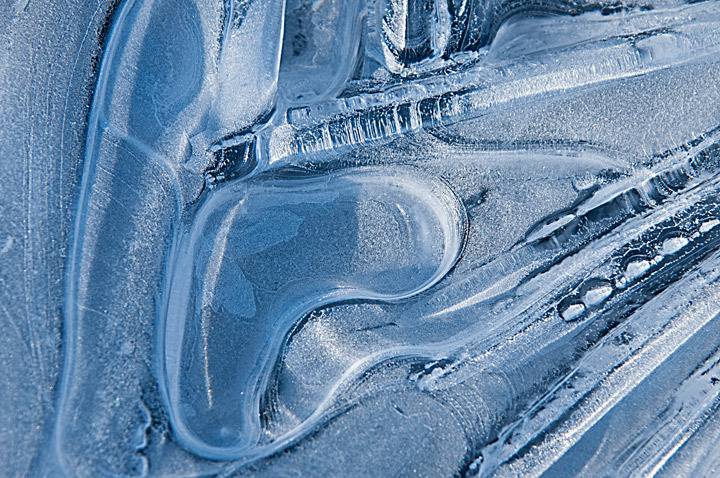 You can find more ice pattern photographs on my website. Since photos are arranged in chronological order you will need to page through the photos to find the older ice pattern photos. 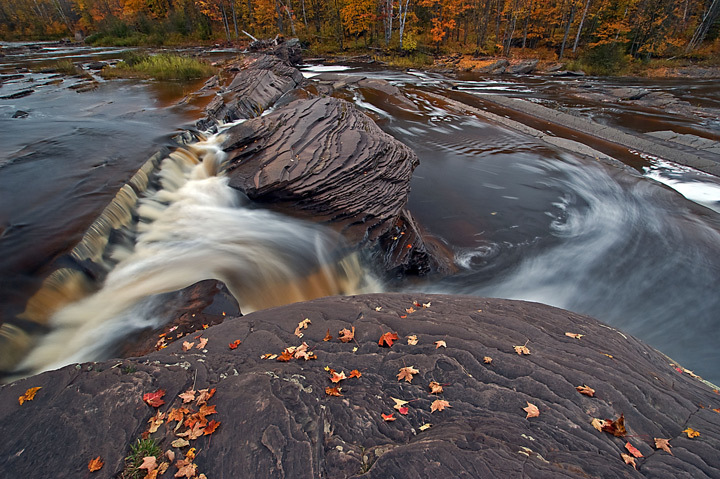 Bond Falls is one of the most photographed waterfalls in Michigan. It is particularly popular during the fall color season when photographers are jockeying for position to capture the iconic photo. 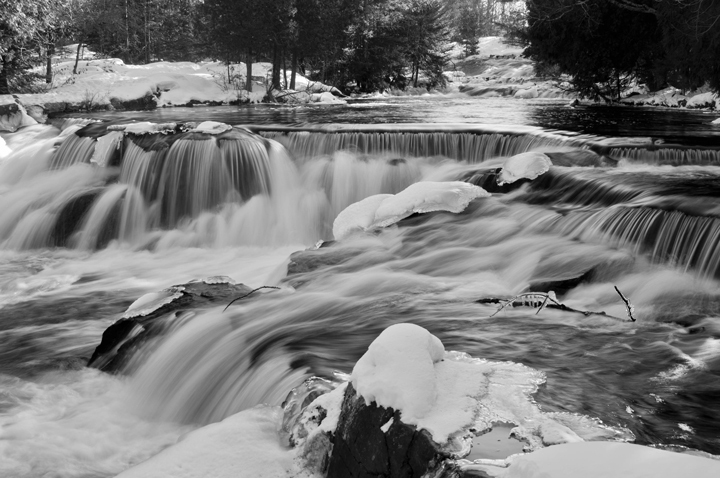 Bond falls also offers some great photographic opportunities in the winter. In my opinion the winter is the best time to photograph Bond Falls. 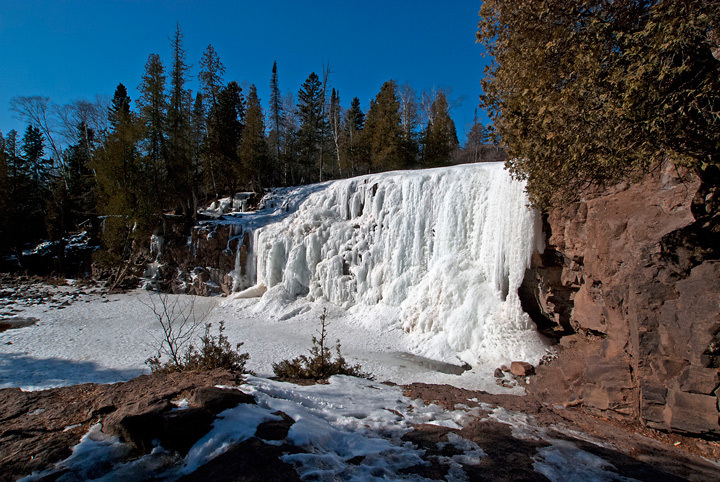 Most waterfalls do not offer good photographic opportunities in the winter because they are frozen solid. Bond Falls on the other hand has running water most of the winter because it lies just below a dam. 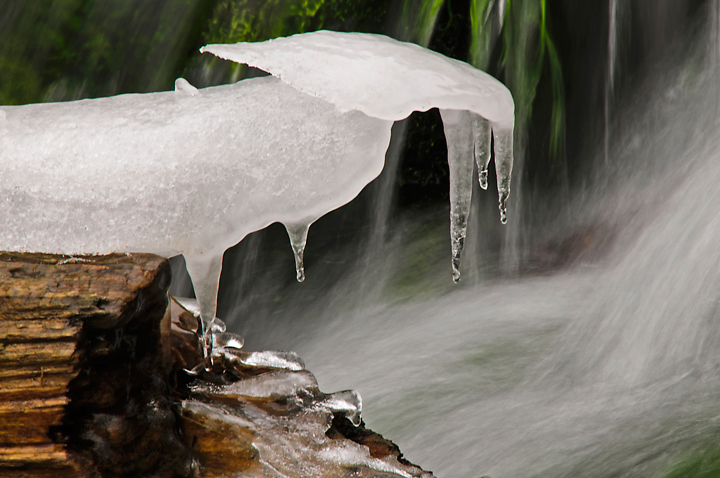 This creates conditions where you have a great combination of running water and fantastic ice formations. 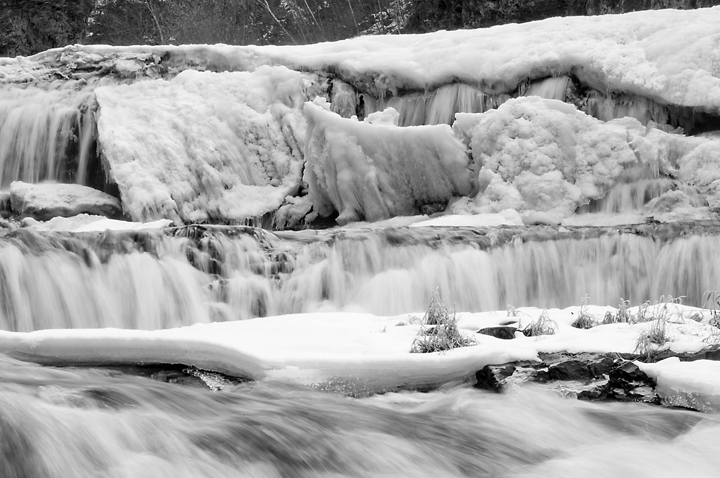 I’ve been to Bond falls several times in the winter and each time have managed to get some great photographs. 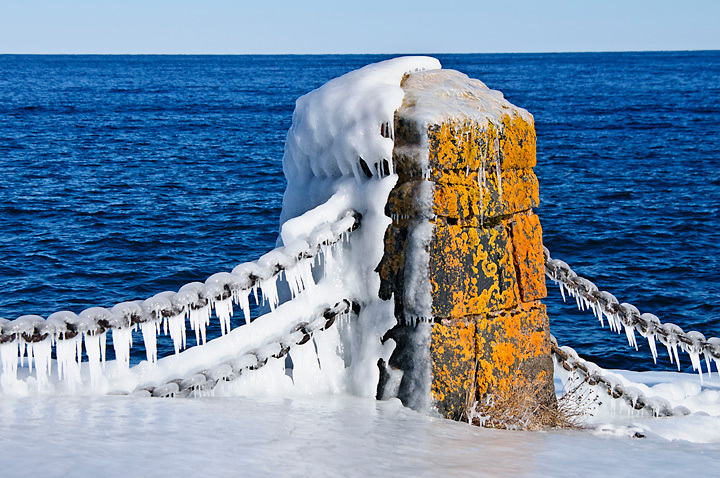 It is a little more of a challenge to photograph in the winter. 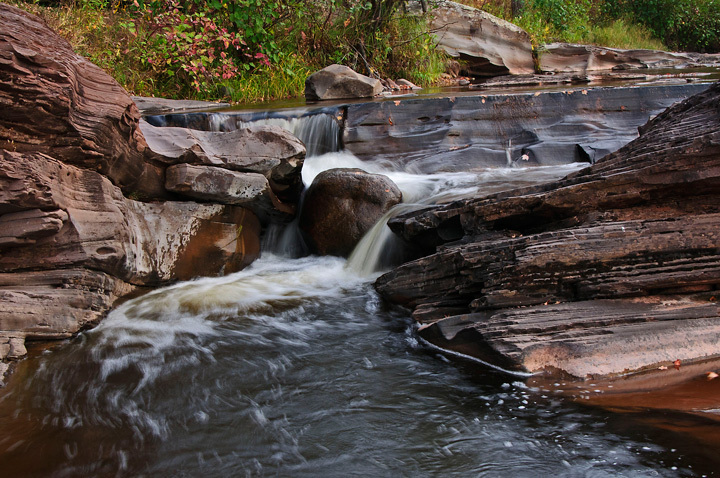 There are trails along both sides of the river down to the bottom of the falls. They are usually snow covered but well packed in by folks visiting the falls. 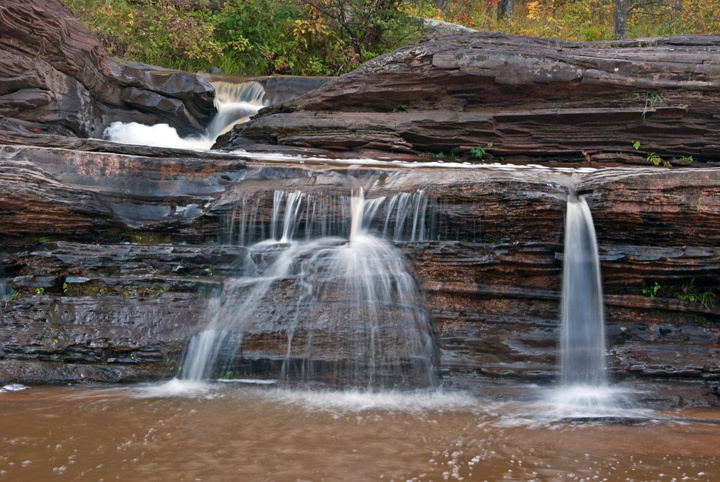 However, the steps that start at the top of the falls are usually covered in a thick coat of ice. My wife and I always wear ice cleats on our boots so we are able to walk around the falls without slipping and sliding. More photos of Bond Falls can be found on my website. 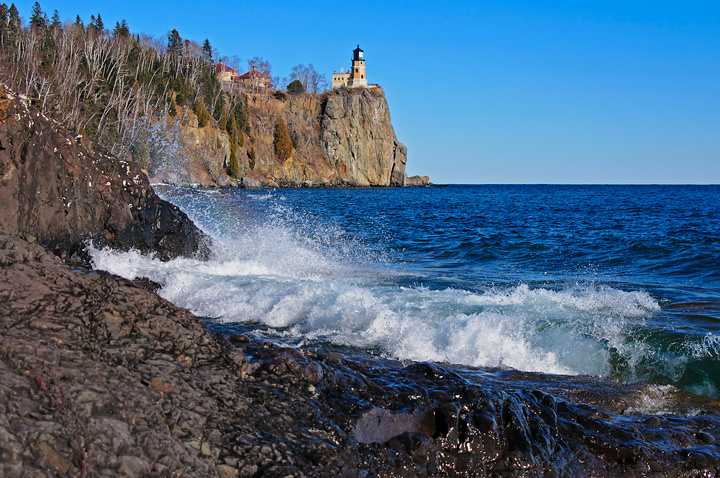 I returned home, from the North Shore, for one day before heading out again. This time my wife and I took a long weekend ski trip to the Upper Peninsula of Michigan. 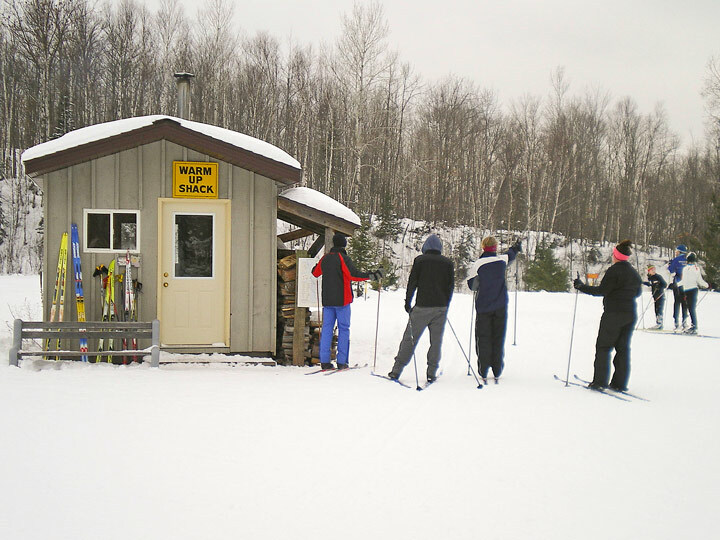 We don’t have any snow for cross country skiing in our areas and the closest good snow is in Ironwood so that was our first stop. We arrived around noon and after a quick lunch headed out to ABR for an afternoon of skiing. It was cold with the air temperatures in the teens, strong winds and a wind chill -20. It was overcast with flat light. One of the things I like about skiing in the U.P. is that the trees are usually covered with a lot of snow. Not much of that with the wind blowing 20 mph. The shot on the right was taken on an earlier trip to ABR. The trails were in good shape considering there was about 4 inches of fresh snow and the wind was really blowing. In spite of the conditions there were a fair number of skiers out. It was cold but we had a great time. On Saturday we planned to ski the entire day at ABR. We knew it was going to be really cold again. It was 5 degrees when we reached the ski trails with strong winds again. 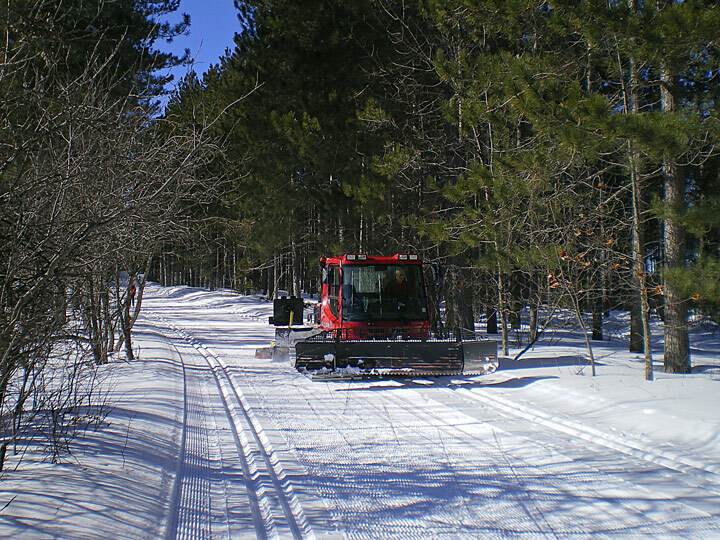 ABR does and excelled job of grooming and all of the trails had been freshly groomed and tracked and with the cold weather they were hard. Fortunately the sun was out so it made it a little bit warmer. In fact we both were a little warm by midday and had to adjust out layers. There were quite a few skiers out training for the American Birkebeiner ski race with comes up in a few weeks. We skied a number of trails that we hadn’t been on before and had a great day of skiing. On Sunday we drove up to Houghton, Michigan. I was the Winter Carnival weekend at Michigan Tech. When our son was attending Michigan Tech we never made it up to see the ice sculptures so we took this opportunity to stop and seen them. There was some great sculptures. 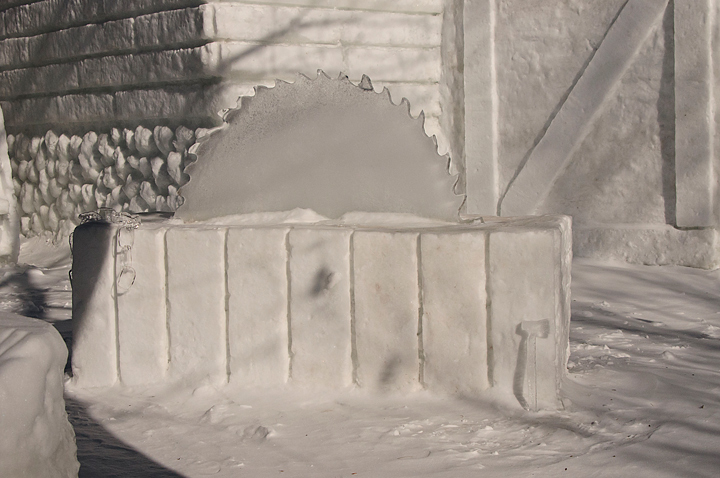 This photo was part of a larger sculpture depicting the logging industry. The temperature was in the 20’s but a strong wind made it a little cool. Wind gusts were as high as 40 mph. After walking around campus we headed off to Swedetown for some more cross country skiing. We arrived around noon. The sun was out which is a rare thing to happen when we visit Swedetown. The wind was also blowing very hard. In the open areas the tracks were filled in with snow but overall conditions were good. We skied some of the trails that we skied during our last visit but with the clear blue skies were didn’t recognize the trails. Usually when we are skiing it is overcast and snowing. Unfortunately the strong winds had blown the snow off of the trees which, for us, is a prime reason for skiing Swedetown. On Monday we headed for home with only one stop on the schedule. That was Bond Falls. 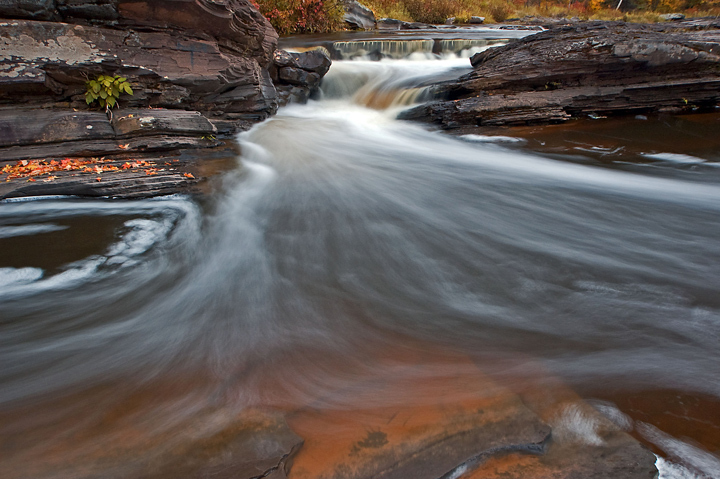 Bond Falls is one of the best known and most frequently photographed waterfalls in the U.P. During fall color season it is overloaded with photographers. In the winter there are still visitors but not nearly as many. 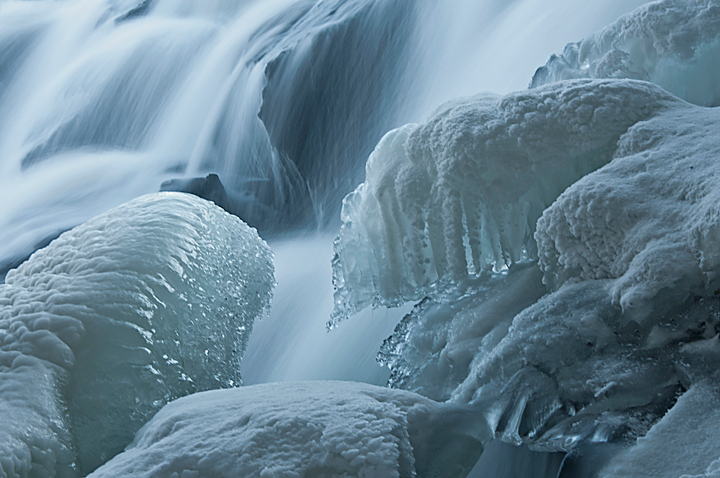 In my opinion winter is the best time to visit the falls because there are so many ice patterns and ice sculptures to photograph. 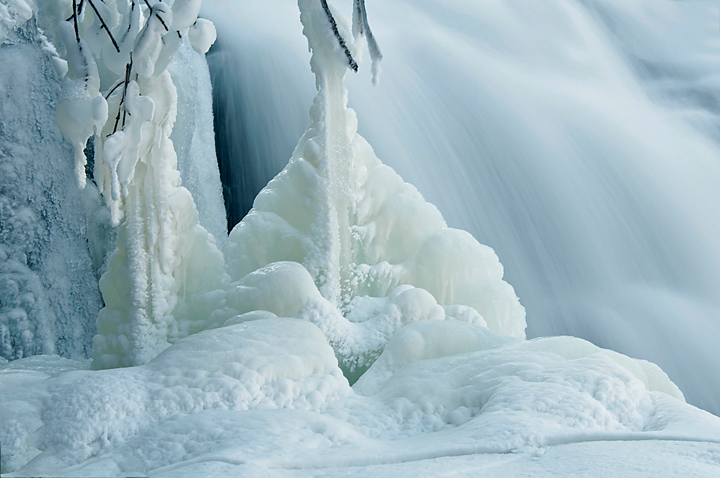 I’ll have more about winter photography at Bond Falls in my next blog. 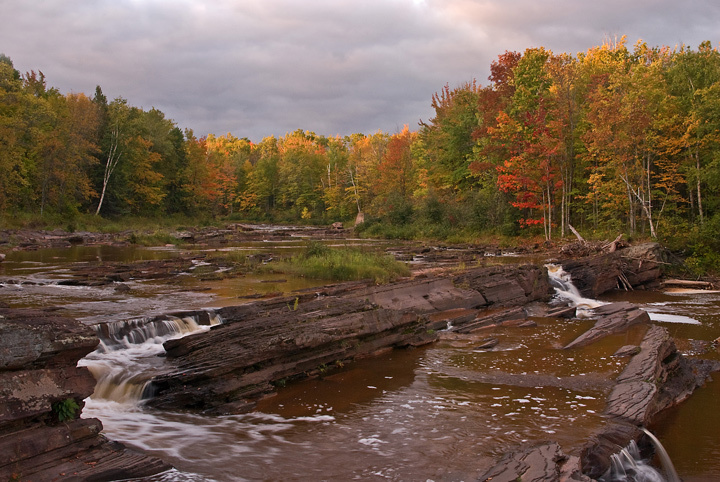 Last weekend my wife and I drove over to Willow River State Park. When we left home it was a bright sunny day but as we neared the Wisconsin border we encountered heavy fog. The trees along the road were covered with frost. On my last trip to Willow River the same thing happened but the frost disappeared before I reached the park. 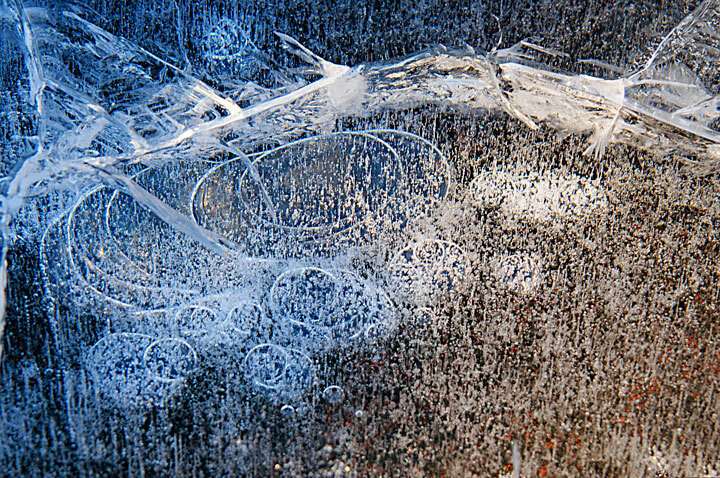 This time when we reached the parking lot everything was covered in frost. I was there would be frost on the trees near Willow Falls but as we walked into the river valley the frost disappeared. There was not a lot of good ice at Willow Falls. 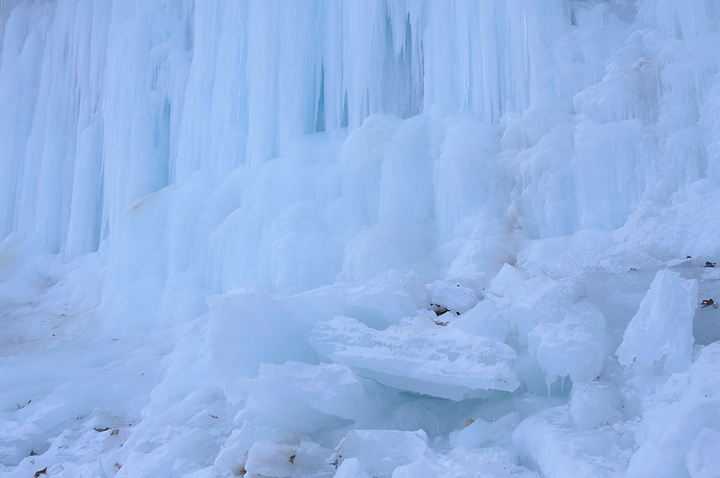 There were some big chunks near the top of the falls but not a lot of interesting ice near the bottom. After shooting at the falls we decided to walk west along the river to see if we could find any Trumpeter Swans. 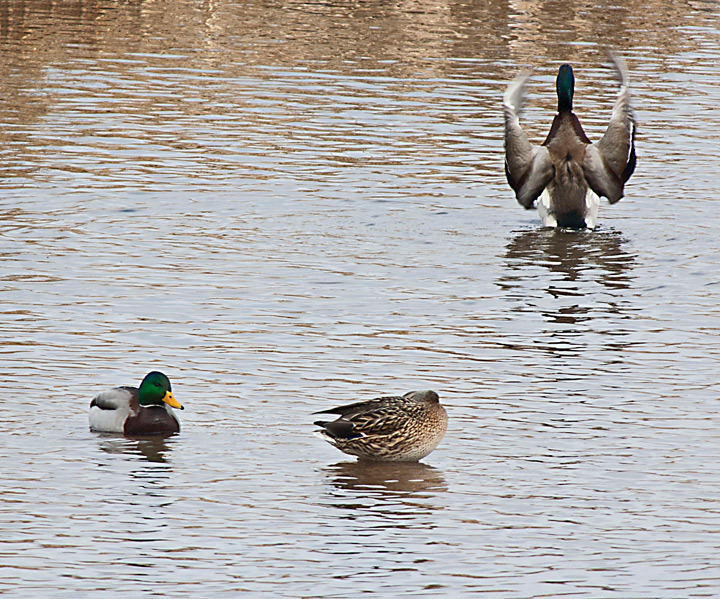 I had seen them fly over on my previous trip and I know they winter in the open water below the falls. Normally you can’t walk along the river trail because it is a ski trail in the winter. However, the weather has been so warm that the trail is not skiable and continues to be used for hiking. We did find some ducks and geese along the river but no swans. We met another hiker who said the swans were on some open water at the head of the lake. Shortly after we arrived they took off. There were some potentially great shots of them flying with dark clouds in the background but there were too many trees in the way to get a clear shot. 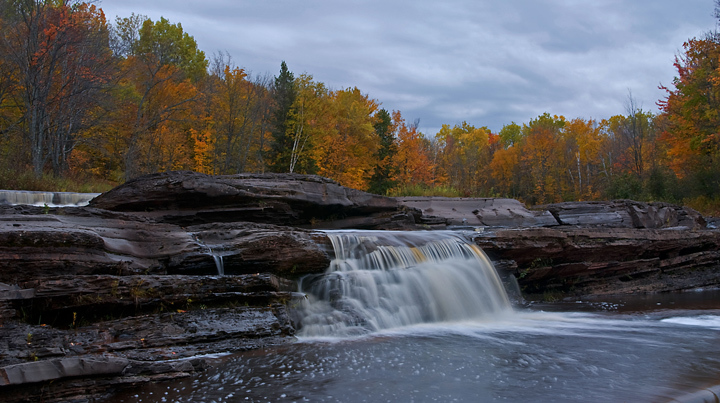 More photos from Willow River can be found on my website. Looking for some exercise my wife and I decided to drive down to the south terminus of the Red Cedar Trail. We parked in the parking lot and took a footpath that goes under the bridge over the Chippewa River. We then walked west along the Chippewa River until it intersected with the Red Cedar River. I had hike this section last summer but it was my wife’s first visit. The temperature wasn’t that cold but a brisk wind and dampness made for a chilly hike. The highlight of the walk was the large number of Bald Eagles that were fishing along the river. We probably saw over a dozen mature and immature Bald Eagles both sitting in trees and actively fishing. They kept our attention during the entire hike. I captured this eagle just as it hit the water. He went to a tree and seemed to be eating his catch but it wasn’t a very big fish. We also saw quite a few ducks. From a distance they appeared to be Common Goldeneye’s. 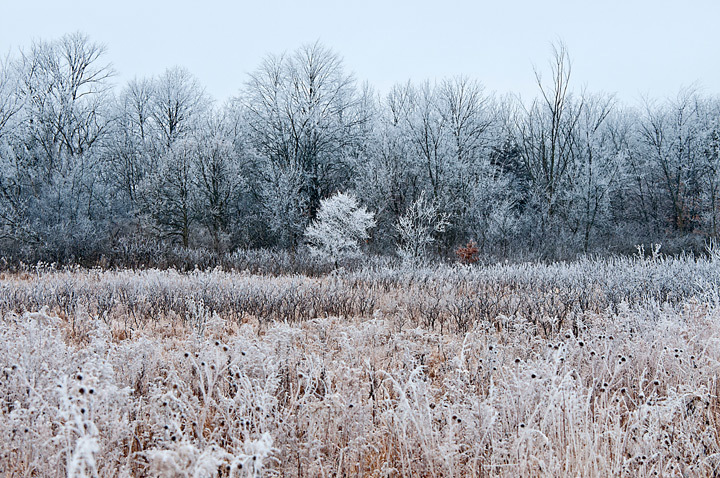 There was frost on the vegetation along the river. 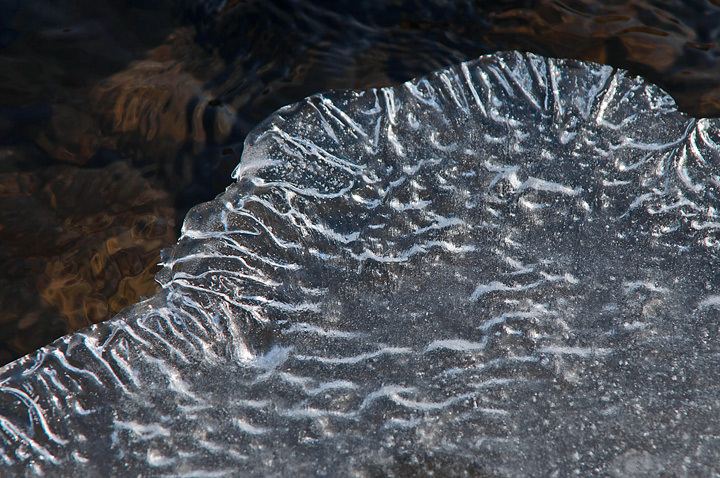 I found this interesting pattern of frost on the sand just below the bridge over the Chippewa River. 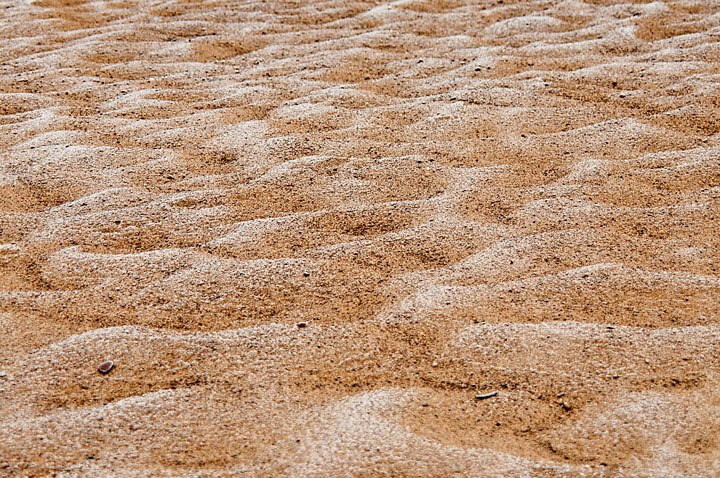 As we walked along the shore we encountered several places where the sand was singing.